It's my birthday this week, which has meant some brilliant presents, a few of which seemed to have a, ummmm theme. 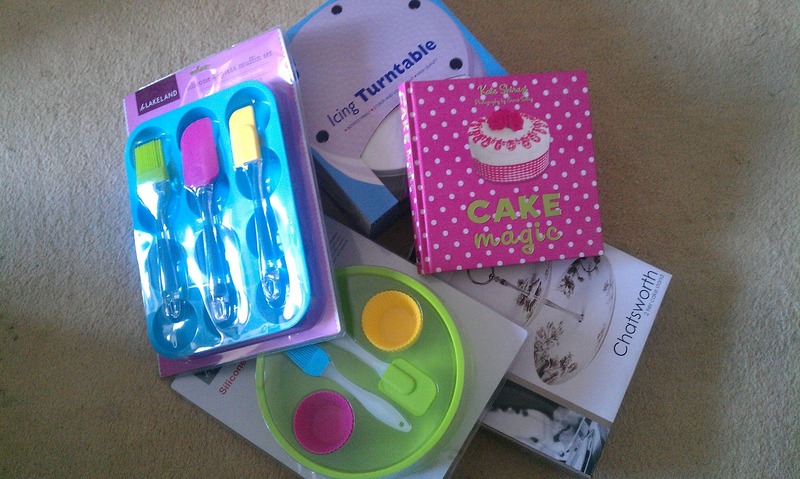 As you can see in the picture to the left, I got quite a few brilliant, baking goodies! Aaaand my Mum made me an amazing birthday cake, yoghurt and lemon flavour mmmm, what a treat! 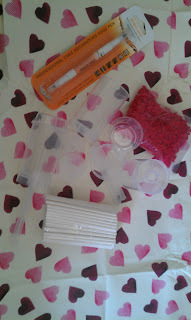 I also put in an order for some cake decorating bits and bobs last week, which arrived at the weekend. So all in all, excitement has been running feverishly high, and my creative cake fires have been very heavily fuelled over the last few days. 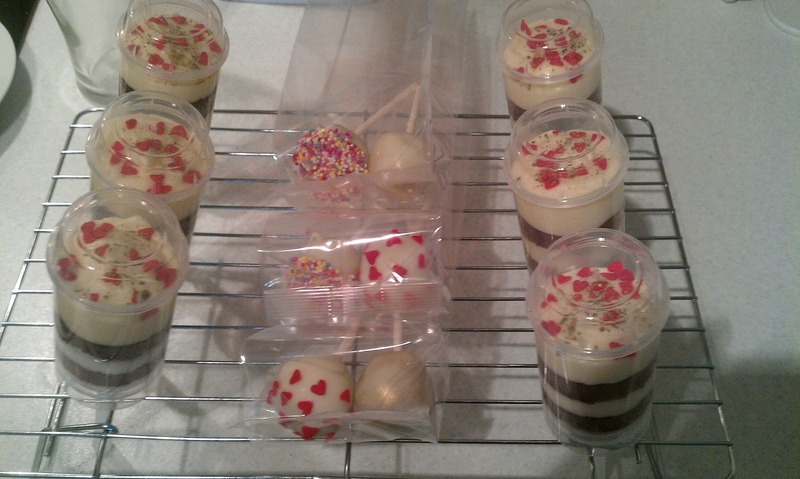 I have been really excited about the idea of trying to make cake pops, and having come across the concept of cake push pops, well, that has just GOT to be tried! Don't you think?! So I bought myself some pop sticks, and some push pop containers, as well as a few decorating extras. Happily enough, I am also on annual leave this week, which is brilliant, because I am soooooo very excited to get to work with some of the new things I have acquired. Today I used the red velvet cake recipe from my new book. 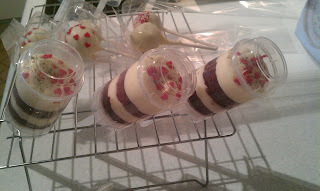 I made red velvet and cream cheese frosted cake push pops. 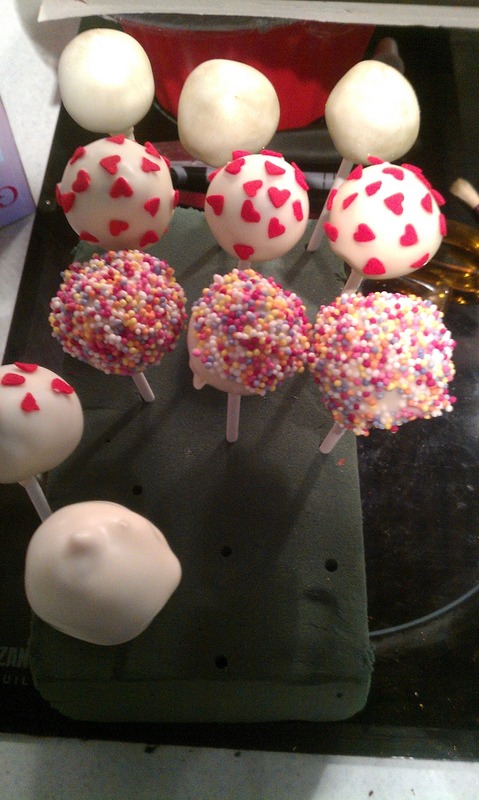 And also white chocolate coated cake pops. These are a friends birthday present. Perfect for putting in the post! Oh my, these are fun! You can do so much with them! The possibilities are limited only by your imagination. 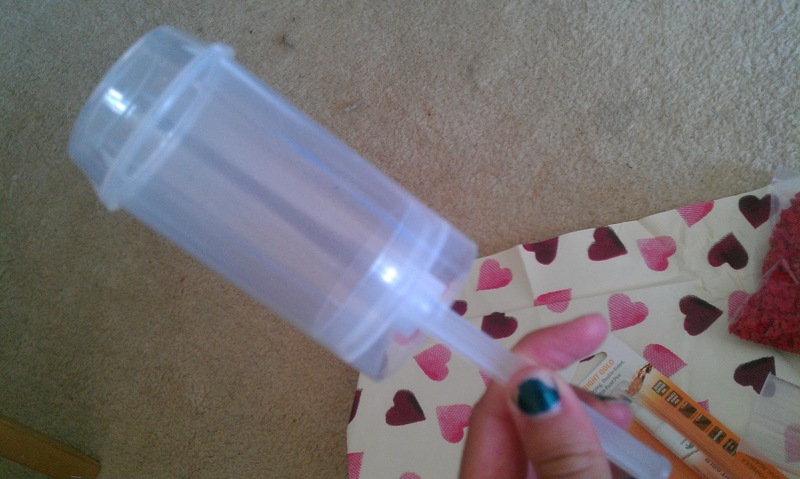 You start off with a little plastic push pop container like the picture below. I bought mine online, but when I went into my local cake decorating shop today , they had them new in (more expensive mind you, but they were there! ), so it would seem that they are catching on quick, and available in shops now too. 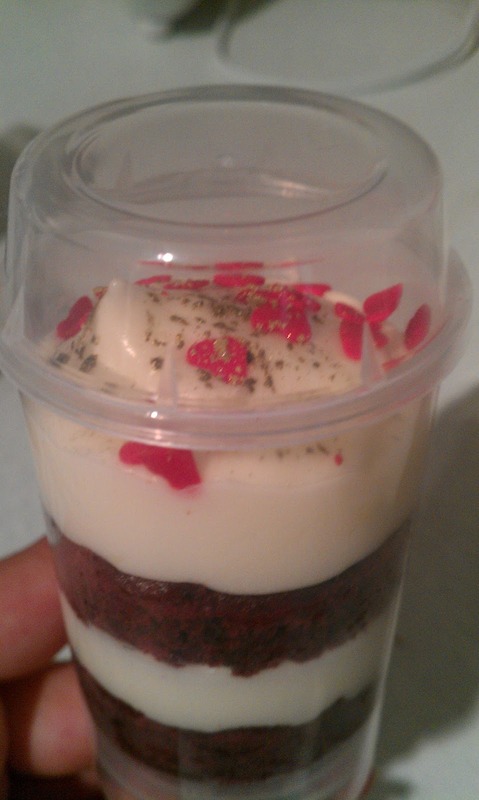 I took my baked and ready red velvet sponge, and using one of the pop containers, cut out circles of cake. These were layered with white cream cheese frosting, piped in, with the top layer of icing swirled as well as I could manage to create a pretty finish. 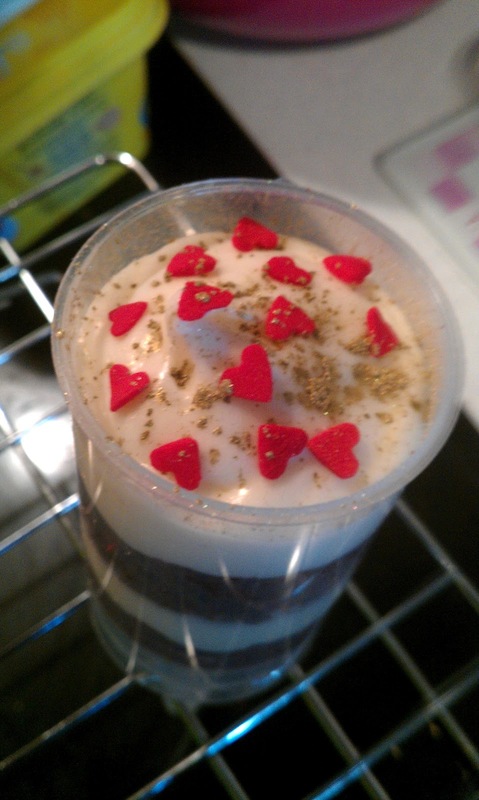 I then decorated with edible gold glitter and red sugar love heart sprinkles. I can't wait to find out how my friend likes them! I think they have made a really cute present, and I just desperately hope that they come out the other end of the postal system still looking cute, and not a complete mess. After stumbling across the Bakerella web site a couple of weeks ago, which lead me to making cupcake hamburger meals I have become a little obsessed with her site. I have been looking at many of the amazing cake pops, and I have been desperate to try some for myself. 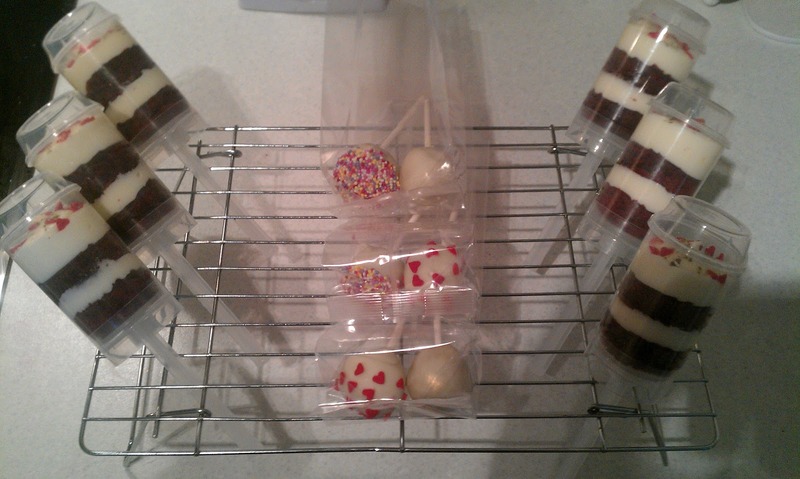 Soooo I went and bought myself some pop sticks in preparation, and when I had my cake offcuts left over from the push pops above, I got to making some! I crumbled the cake offcuts into a bowl, and added a nice large dollop of the cream cheese frosting, then mixed well. This created a lovely gooey cake mess, which I then rolled into lollypop sized balls , and left to sit whilst I got everything else ready. 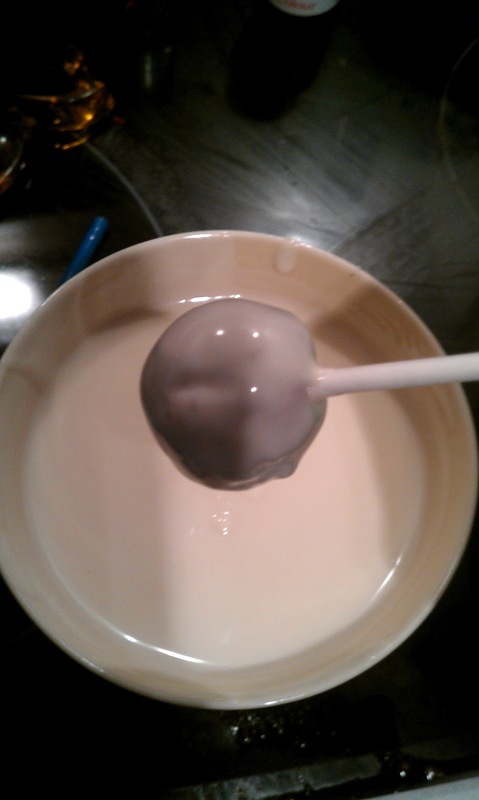 I melted white chocolate cake covering in my microwave, and got my lollipop sticks stuck into my cake balls, and I got dipping! 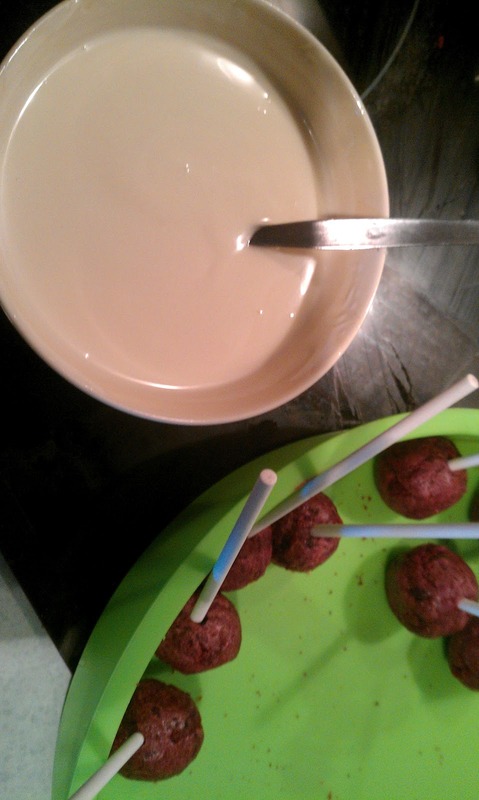 Each ball was dipped in the cake covering to coat the whole ball and as little as I could manage of the pop stick (though I must admit I am not the neatest person in the kitchen whilst I'm in the middle of things, and there was a great deal of runny white chocolate mess going all over the pop sticks, my counters, and well, just about everywhere!). I had a handy piece of florists foam block to hand which I was then able to put the pop sticks into whilst the coating dried. 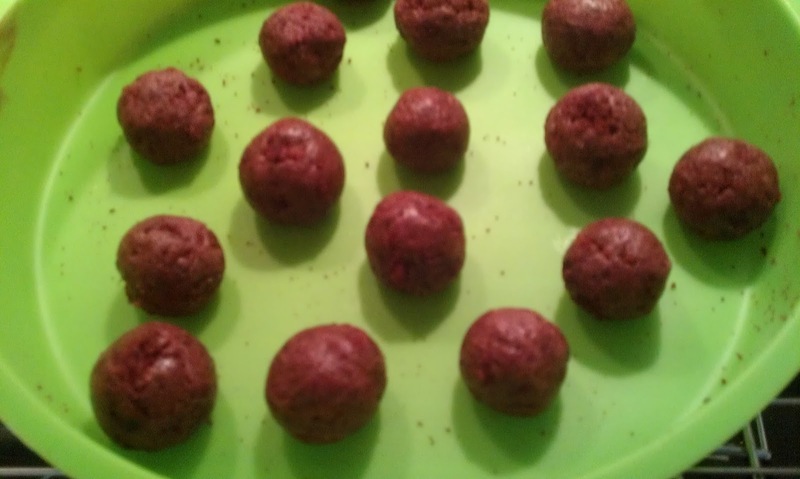 Soon after removing from the microwave, when the coating was still very warm, some pops needed a second coat after the first had dried, as the coating was so warm and runny it didn't stick on thick enough, once the coating had cooled some though the others went on thicker. Once the coat on the pops was thick enough I started decorating them. I chose three different types of decoration. Sugar love hearts, hundreds and thousands and gold edible glitter. The love hearts and the hundreds and thousands had to be added whilst the coating was drying, to make sure they would stick. 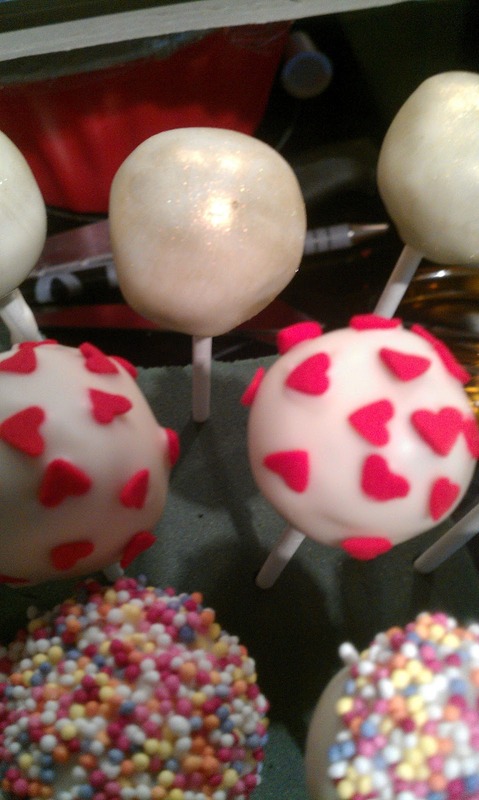 But the gold glitter I simply applied with a dry paintbrush once the pops were solid. They came out so much better than my expectations had been, and looked so cute, that I located some little plastic gift bags and ribbon, and they have gone in the birthday box for my friend as well. Again, I really hope they don't get too bashed, and they arrive still looking good! I had a great afternoon's baking, and I'm so glad I got to do some experimenting! 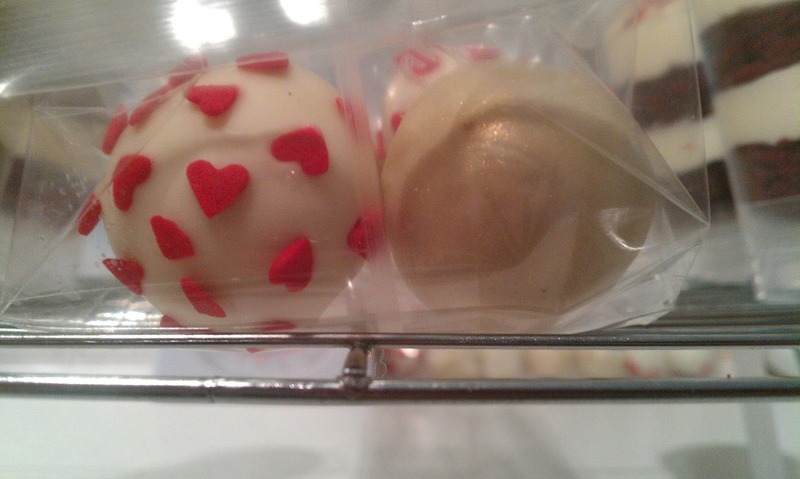 I can't wait to try some more complicated cake pop designs. There are just so many things that you can do with these! I might be lead astray from my giant crazy cakes for a while with the thousands of possibilities! But another day, as for now it is time I went to get some beauty sleep. Thanks for reading, please feel free to post any questions or comments.